Ensuring the structural integrity of pipelines is a key requirement in the oil and gas industry, particularly during the installation and maintenance of safety-critical structures. To carry out such pipeline integrity assessments, automated ultrasonic inspection techniques are commonly used. 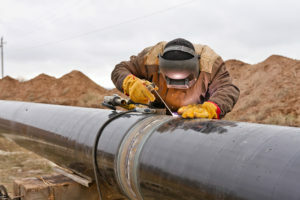 However, there are numerous inspection scenarios where these techniques fail to satisfy the needs of pipeline operators, like for instance complex pipeline geometry with specific angles of the pipes joints. Innovation: EARTO member TWI developed Full Matrix Capture, a new ultrasonic inspection technique capable of generating high resolution fully focussed images of pipelines with high inspection sensitivity to small flaws. This technique increases inspection reliability across multiple pipeline geometries and significantly reduces inspection cost for industry. The inspection process is greatly simplified, taking away many of the setup and inspection complexities of existing techniques, with the potential to de-skill the task of the operator. Impact expected: With trials ongoing, the successful validation of this technology would reduce the inspection costs per project from €0.4M to €0.15M, as well as halving the inspection period from 6 to 3 months. Guidelines on best practice are due for completion mid-2018, and the technology shall reach industrial acceptance and maturity by 2022.